Becca's official televised first date as the Bachelorette has the guys getting pampered and suited up. But alas it's not just about looking pretty and doing corny modeling poses (JORDAN). They're going to run the Grooms Day relay, hosted by former Bachelorette Rachel and her fiance Brian. It's like Double Dare meets wedding puns, like running with a ball and chain or taking the plunge. Lincoln does whatever it takes to make it down the altar to Becca first including possibly cheating and shoving a guy, but he gets a little kiss and a portrait. The guys resent Lincoln and think he's fake, so when Lincoln starts bragging about the wedding portrait that got printed at CVS, it sets Connor and he throws it on the floor, then out the window. Lincoln immediately tells Becca about what happens and believes physically threatened and has no respect. Becca pulls Connor aside about his behavior and he apologizes for being a little extreme. Oh but some actual connecting happened with Becca and she gives the group date rose to Jean Blanc. For her first 1-on-1 date of the season, the show reminds us again that Becca was formerly engaged and therefore has bad memories. 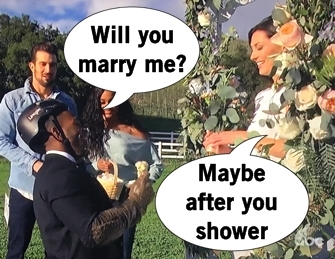 Becca and Blake get some sledgehammers and got to smash TVs playing her proposal on loop, champagne glasses, a racecar, and lots of other stuff to get the rage out while Lil' Jon performs "Turn Down for What". I'm taking a bold stance: this is the best date in the entire franchise's history. While some interns spend the night sweeping up broken glass and leaving cracked TVs on the curb for trash day, Becca and Blake head to The Warwick for a romantic dinner. Blake opens up about a relationship where he said I love you and was very excited but saw texts on her phone days later of her friends asking if she broke up with him - ouch. What Becca likes is that Blake wants to get to know her and not know The Bachelorette. Becca gives him the date rose and they smooch a bunch. 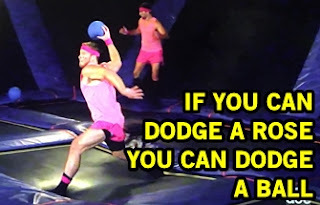 For the last group date date this week, Becca brings the guys to a loal gymnasium to get trained in dodgeball by some sassy child actors (I see you, kid from The Toy Box). But this is a warm-up for the big event: a dodgeball championship at the indoor trampoline park. The Green Frogs easily defeat the pink team, so bad that I don't even know the team's name. Afterwards, they head for drinks and stealing Becca's time at The Four Seasons. .Colton has a secret he has to get off his chest and reveals he used to date former Arie ex-girlfriend, Tia. Becca's shaken and worried Colton came on the show for the chance to date Tia, not her. Wills ends up getting the group date rose after some great bonding over his parent's 50th anniversary. It's only week 2 and Becca's stressed by the drama of all her men and the lack of trust she's feeling so early. Clay tries to lighten Becca's mood with touchdown dances and Connor brings a CVS-printed photo of himself for Becca to throw into the pool and get rid of bad Connor. Jordan the Male Model strips down to his undies to get attention and just comes off even sadder than you can imagine. Blake finds it disrespectful to roll up to a cocktail party in his underwear and yes this is a real argument happening. Colton reassures Becca he's here to get to know her, but she admits she's going to be more guarded with him for the time being. Despite her reluctance, Becca gives Colton a rose. Leaving this week are Alex (who? ), Rickey (who? ), and some other guy who I truly cannot even identify on the cast page.